There is nothing more beautiful and tasty than a bowl of seasonal juicy berries. Macerating berries allows the fruit to release their flavoursome juices. It is simple to prepare and enhances the presentation of the fruit. Use the berries as a garnish on a dessert along with drizzles of their lovely juices. 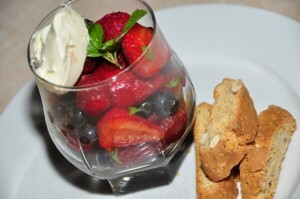 Place prepared berries in a bowl, add the sugar and Vino Cotto. Gently toss to coat the berries and allow to macerate for 30minutes to 1 hour at room temperature. Stir occasionally. Serve the berries and it’s flavoursome juices in a glass/bowl and top with a quenelle of mascarpone cheese, ice-cream or fresh cream. Alternatively, you can gently heat and reduce the juice to slightly thicken over a gently heat. Drizzle the cooled syrup and fruit on any desserts such as Pavlova, panna cotta, cheesecake, crepes, pancakes etc.